The Gold Coast is renowned for its sun-kissed beaches and infamous nightlife, but the truth is, there is so much more to the Gold Coast than most people think. My version of the Gold Coast is pristine beaches with soft sand and clear blue water. On the other hand, there is the hinterland of the Gold Coast that is filled with hidden waterfalls and hiking trails, waiting to be explored. A trip to the Gold Coast truly is what you make it. These are some of the best Gold Coast hikes. Burleigh Heads National Park offers the very best of the best: perfect views of the Gold Coast City skyline, access to remote beaches and creeks, native rainforest and a number of unique viewpoints. If you’re lucky, you may even be able to spot the whales and dolphins playing around offshore. Burleigh Heads National Park, located in the heart of the Gold Coast, is the ideal hike for those short on time. This Gold Coast hiking trail exposes you to all the different elements and gives you a taste of the natural side of the Gold Coast. Some highlights within Burleigh Heads National Park are Tallebudgera Creek, Tumgun lookout and Echo Beach. Purling Brook Falls is by far one of the most impressive waterfalls to be found on the Gold Coast, located within Springbrook National Park. The trail to the base of Purlingbrook Falls is around 4km return. Expect stunning views of the Gold Coast hinterland, towering native trees and a gushing waterfall and swimming hole at the base. Read the full guide to Purling Brook Falls. Travel tip: Combine your trip to Purling Brook Falls with Best of all lookout. 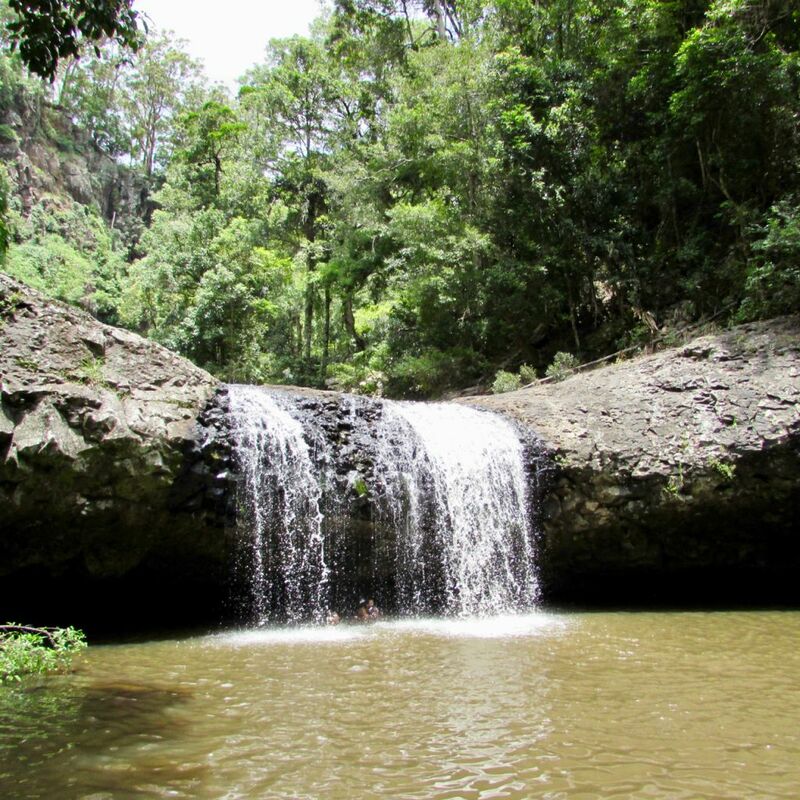 Lip Falls is a stunning waterfall and swimming hole found in the scenic rim region of the Gold Coast hinterland. The great thing about Lip Falls is that it is still a secret amongst many, so you can expect little crowds. Read the complete guide to Lip Falls. The Natural Bridge in Springbrook is one of the most magical places on the Gold Coast. The trail to the Natural Bridge is 1km long and suitable for families and all fitness types. You will walk through ancient rainforest down to the waterfall that flows into an open cave, that fills with glow worms by night. Read the full guide to hiking the Natural Bridge here. 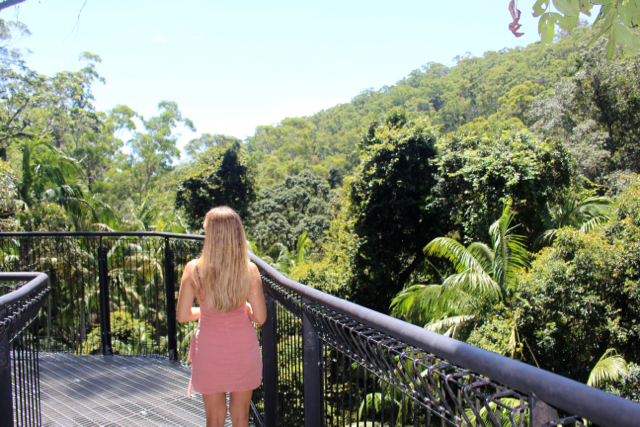 The Mount Tamborine Skywalk is South-east Queensland’s longest elevated canopy rainforest walk, taking you out over the top of the rainforest. The trail is a 1.5km loop trail. You do have to pay to do this hike, so if you are on a budget, I would skip this one. Read the full guide to Mount Tamborine Sky Walk and if you are in the area, make sure you check out Cedar Creek Falls. This hike is found just outside of the Gold Coast, in Northern NSW. Mount Warning is the highest peak in the Northern NSW region, offering 360 degree views over the region, all the way from the Gold Coast to Byron Bay. This is also the first place that sees sunrise in Australia. This hike is a strenuous 9km return hike. Read the full guide to Hiking Mount Warning. Get an early start to the day if you plan on hiking. This will allow you to beat the heat and crowds. Snakes live in the Gold Coast hinterland, so watch your step. Always carry lots of drinking water. 1 litre per hour is recommended. Sunscreen and a hat is a must, even in winter. If you found this guide on hikes near the Gold Coast helpful, pin it for later! Disclosure: This post on Gold Coast Hikes contains affiliate links.